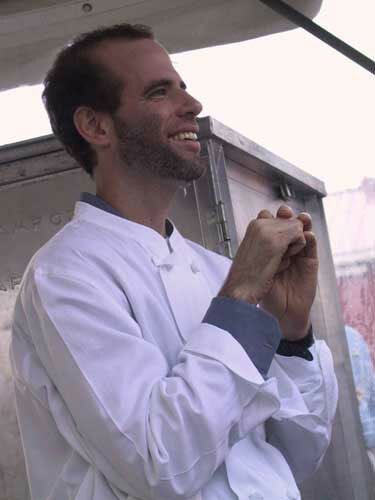 Pictured here: Chef Dan Barber of Blue Hill restaurants in New York. Taste3 invited Dan Barber's twin to come and speak for the second year in a row, and I say twin because this guy is a masterful story teller, an actor and performer, and so obviously not the same Dan Barber the chef I've heard of. At last years Taste3, this Barber brought down the house with his hilarious story of carrots and castration, with special emphasis on Boris the boar and his back end (click here for last year's talk). In other words, can you say boar's balls? Apropos of nothing, except perhaps my mood, here is a photograph of the full moon rising on New Year's Day evening. What a surprise to hear that my blog was nominated as one of the Top Five Blogs (Rural) in the annual Food Blog Awards. Please go and vote for either Farmgirl Fare or Lucullian Delights, don't waste your vote on me: I don't want or need or deserve a win in this category. Best New: How in the hell did MattBites and Michael Ruhlman get omitted from this list? And a Rachael RAY blog "best" of ANYTHING? Dark times indeed. No recs! Photography: Again, no MattBites? No StillLifeWith? No recs! Best Single Post: hands down, Gluten Free Girl's YES. Adam's post is pretty clever, too, but nothing approaches the inspiration and care that GFG employed in her post. Best Recipes: 101 Cookbooks, of course. Best Restaurant Reviews: again, BecksPoshNosh. Sam is the best. Best Blog with a Theme: Meathenge. Best Writing: Kitchen Notebook. What a lovely site to visit. That's all. I am disappointed in a lot of these categories, and disappointed that some really high-quality blogs are not on there—but maybe I should blame myself, because I was too busy to see that quality material was nominated. Derrick Schneider's blog, An Obsession with Food, for one, deserves an award. And the Eat Local Challenge as a Group Blog would have been nice to see. (Though I still would vote for The Ethicurean.) I'm disappointed that Cookie Crumb's "I'm Mad and I Eat" wasn't nominated for humor, too. Oh yeah, big news coming up about some people here in town doing fabulous things with farm-fresh, real-life food. Watch this space for yet another reason to be visiting Santa Cruz. 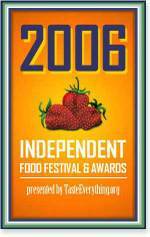 When faced with the opportunity to give an award in the 2006 Independent Food Festival for excellence to a single food item, I was looking at a crowded playing field. The instructions we received said: "You should feel very strongly and passionately that the recipient deserves the recognition and that the food you are describing is truly special." I went through all my photographs and blog entries from the past year, to refresh my memory. (I recommend this. Go back through your blog and see all the wonderful food you've eaten. If you don't have a blog, use mine. Heh.) How could I pick just one thing from a list that included a Marin Sun Farms steak dinner on a foggy hilltop in Marin County, prepared by Chef Michael Tusk and the Quince staff; multiple meals and dozens of courses at Manresa, several trips to the Ferry Plaza marketplace, a chef's tasting lunch at Dévi in NYC, dinner at Blue Hill Stone Barns prepared by Chefs Michael Anthony and Dan Barber—or the figs, crosnes, cardoons and more that farmer Peter Jacobsen had handed to us during the visit to Jacobsen's Orchard in Yountville, where everything he grows goes into the kitchen at French Laundry? And what about that corn-lobster bisque I had at Theo's restaurant in my little village of Soquel, which was so good it brought tears to the eyes of Jasmine Roohani and Kirsten Roehler, the farmers who had grown the corn? And then there is that sandwich I get at River Street Cafe and Cheese Shop: Niman Ranch steak with a cognac-gorgonzola sauce, that I've recommended nonstop since I had my first one in December. Yow. Not to mention the things my farmer friends grew: Cynthia Sandberg's Love Apple Farm heirloom tomatoes (145 kinds—though I didn't taste them all), Rancho Gordo beans, Thomas Farm "Red Gold" potatoes, Dirty Girl Produce shelling beans or haricot verts, the yellow raspberries at Live Earth Farm, Happy Boy Farms' pattypan squash, the delicate pea sprouts from New Natives, Marina Di Chioggia pumpkins from Crystal Bay Farm, Swanton Berry Farm's strawberries, the amazing peppers from Everett Family Farm, the beautiful baby carrots that Ronald grows on Windmill Farms, or Betty Van Dyke's Blenheim apricots, so fragrant and flavorful? This is not an easy choice to make.